“The Here and Now project holds a great deal of value within our local community and within our larger global community. 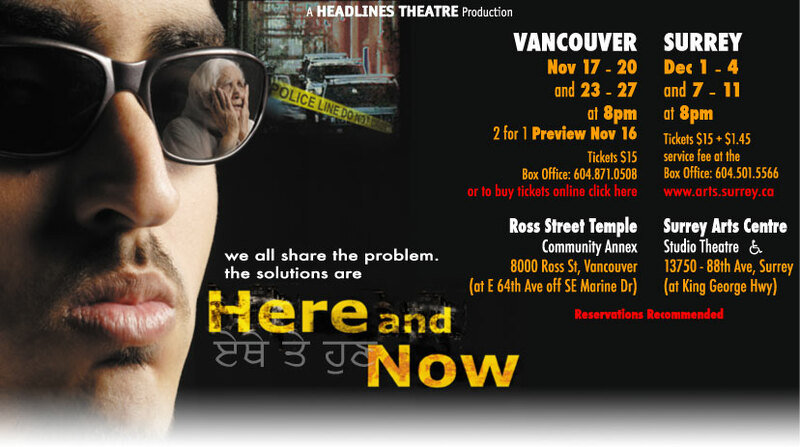 As a member of the local Indo-Canadian community, to introduce this production with a discussion on the politics of race was valuable. By illustrating this point with an example of the non-racial identification of a 'white'/'Caucasian' gang like the Hell’s Angels - it does hit home with individuals that have never considered the racial profiling conducted by the media. And the exercise of interrupting the play and re-placing one of the performers and performing the "choice" was extremely useful. Many of us can sit back and judge what needs to be done but by performing the actions - you become involved in not only critical evaluation but the common sense factor. I think this project was highly effective and positive on multiple levels.